Sjogren’s syndrome is an autoimmune disease that affects the glands which are responsible for keeping the eyes, mouth and other parts of the body and parts of the body that are moist and lubricated This why dry eyes are common in Sjogren’s syndrome. Men and women at any age or race can develop Sjogren’s syndrome. However, it is prevalent among Caucasian women, typically beginning between the ages of 40 and 60. It is estimated that nearly 4 million Americans suffer from Sjogren’s disease nearly 90 percent are women, and almost 3 million people may people unaware that they have the condition. Since dry eyes are a very distinctive symptom of Sjogren’s syndrome, often the disease may go unreported. According to researchers 1 and ten dry eye patients also have Sjogren’s syndrome. In some cases, it can take up to four years of longer from the start of the condition to get an accurate diagnosis. 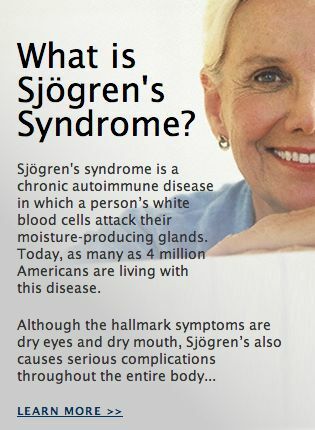 Sjogren’s syndrome is one of the most pervasive autoimmune disorders. In this condition, the person’s white blood cells attack itself, including tissues and organs, resulting in damage. The reason why the immune response is abnormal or the why it destroys the body’s tissue is not completely understood. Normally the immune system recognizes parts of its body as “friendly” and become active only to attack and destroy “foreign” substances or dangerous organisms such as viruses and certain bacteria. Abnormal immune responses may be inherited or can be associated with previous viral or bacterial infections. Sjogren’s Syndrome can occur alone ( primary Sjogren’ssudnome ) or it can happen along with other autoimmune diseases, such as rheumatoid arthritis, lupus scleroderma, or celiac disease. Additional eye symptoms can include blurred vision, light sensitivity, burning sensation in the eye. Another test may include using color dyes to for your tears, and the doctor will examine the eyes with a microscope to see how quickly your tears will evaporate as well as the dryness-related damage has occurred within the cornea or conjunctiva. The quality and quantity of saliva created in the mouth may also be measure. You doctor may conduct additional blood test as certain antibodies can be found in the blood in people with Sjogren’s syndrome. A newer blood test is called Sjo test (by NiCco, Inc) has a more sensitive and accurate method of detecting Sjogren’s syndrome. Not only checking for traditional antibodies, commonly found in the bloodstream, Sjo test three additional biomarkers that are unique to Sjogren’s syndrome. This results in higher accuracy of the result. How is Dry from Sjogren’s Syndrome Treated? Ongoing treatment with artificial tears and ointments may be required for treating dry eye from Sjogren’s syndrome. Oil and lipid based eye drops can be particularly helpful to people with Sjogren’s syndrome because may have issues with their tears evaporating too quickly. These drops can help slow down tear evaporation and allow the eye to stay moist longer between blinking the eye. Your doctor will also examine you for meibomian gland dysfunction (MGD), which is the leading cause of tear evaporation causing dry eye. In MDG the glands in the eyelids that secret oil (meibum) into the tear film is obstructed and inflamed. A decrease in the oil quality and quantity may occur. This oil is imperative in keeping tears from evaporating too quickly. 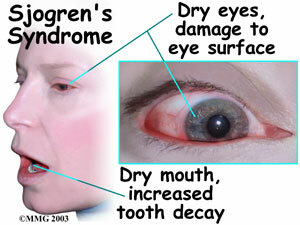 By treating MGD, the dry eye discomfort can be reduced in Sjogren’s syndrome related dry eye. In cases where there are is pain or inflammation, your doctor may recommend taking nonsteroidal anti-inflammatory drugs (NSAIDs) such as ibuprofen and aspirin. If you have a severe case of Sjogren syndrome you may also receive immunosuppressant medications. Sjogren’s syndrome can cause dryness of the mouth, which can lead to tooth decay and loss of teeth. Use of mouth lubricants *artificial saliva) may need to assist swallowing with additional moisture. Also, people with Sjogren’s syndrome also can lead to vasculitis (inflammation of blood vessels) that can cause problems throughout the body. Use Vaginal lubricants if needed. Don’t Smoke, and avoid alcohol. Install a humidifier to help reduce dry eyes, nose and mouth and skin. Regular uses artificial tears and ointments to keep your eyes moistened.